A-SPAN | Let's End Homelessness Together! A-SPAN's Vision is to End Homelessness in Arlington. 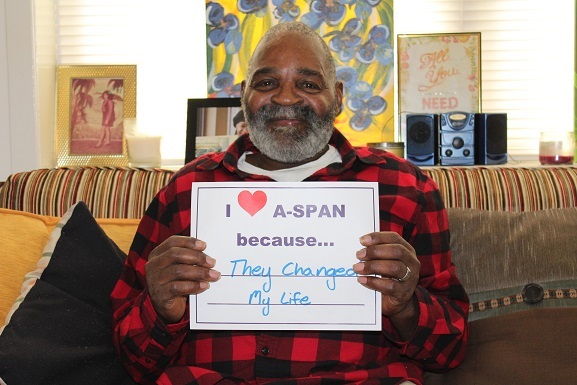 A-SPAN's mission is to secure permanent supportive housing for the community's chronically homeless, including individuals and veterans. The organization provides services every day to offer hope and to help move individuals from homelessness to a home. What Does Your Gift Provide? Donate 100% - Add 3% so that 100% of the donation goes to A-SPAN. A-SPAN has partnered with Network for Good to securely process your online credit card payment via Network for Good (tax ID 68-0480736). This transaction will appear on your credit card statement as "Network for Good." This transaction is subject to Network for Good’s Privacy, Security & Disclosure Statement and the Charitable Solicitation Disclosure.